Our range of products include vintage bedding throw kantha, topicana reversible kantha quilt and cotton reversible kantha blanket. 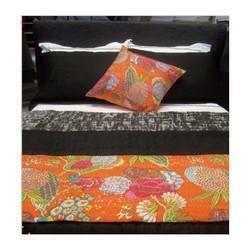 Our firm is engaged in providing our clients a comprehensive collection of Vintage Bedding Throw Kantha. We make use of high grade raw materials and advanced technology for manufacturing these. Our vintage range is made available in a variety of sizes and colors. They may have considerable amount of patches and imperfections as they are vintage products but their quality standards certainly overshadow that. We offer these at competitive rates. We are looking for export inquiries from Japan, Australia etc. Vishal handicraft provided high quality Topicana Reversible Kantha Quilt, we are the leading supplier of home made traditional vintage kantha quilt. We are manufacturer and supplier of handmade items, we also supply in many things in kantha quilt. With the sincere efforts of our artisans, we manufacture superior products for our clients. We are one of the most preferred organizations offering high quality and durable quilts. Choose your own one-of-a-kind piece from our colorful assortment of Cotton Reversible Kantha Blanket Available at economical prices, our fruit print quilts have a great demand in the market. The extra fine running stitch ensures flawlessness in their finish.